For the first week of my Throne of Glass Re-readathon, I read The Assassin’s Blade, a bind-up of the five prequel novellas of the series. If you want to participate in the readathon but don’t have time for every book, I’ll be posting a summary of each one at the end of every week. These will have SPOILERS. In case you haven’t noticed, there are going to be spoilers on this post. 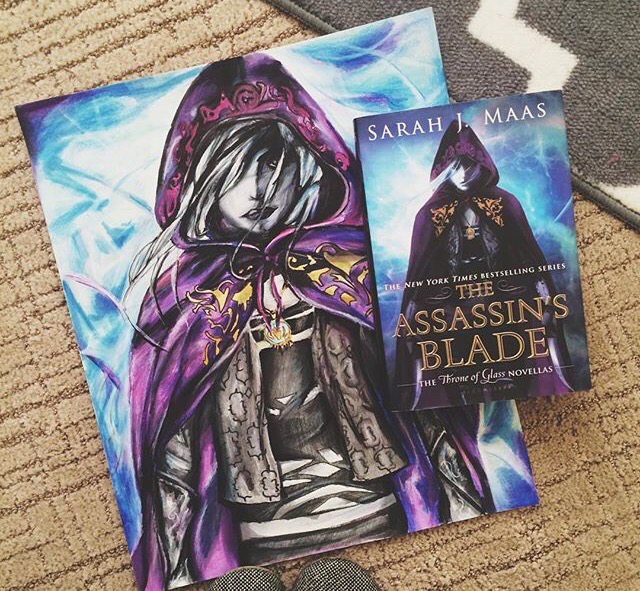 Leave now if you have NOT read The Assassin’s Blade. You have been warned. I will try to be comprehensive (big-picture) in these posts, and for that reason I may miss a few details. If I haven’t included them, I’m sorry, but they aren’t vital to the story. You can read one or all of the novella summaries. Celaena is sent, along with Sam Cortland, by Arobynn Hamel to confront the Pirate Lord about some assassins that were attacked, supposedly by Rolf’s (the Pirate Lord’s) men. As it turns out, Arobynn used this excuse to bring trade negotiations to the Pirate Lord, who sold slaves. Celaena and Sam were there to collect the first batch of slaves and bring them back to Adarlan. After investigating the workings of the slave trade (when shipments will be sent out, guard rotations, etc. ), Celaena plans on freeing them. Sam, who she isn’t on great terms with, knows he’s up to something and decides to help her. On the night before Celaena and Sam are to go back to Adarlan with the slaves, they start a free tab at the local tavern. Just a few hours before, Celaena and Sam had hijacked the ships the slaves were on, putting the slaves in control. However, the slaves couldn’t leave because of the massive chain that blocked off the bay area. While people get drunk at the tavern, Celaena purposefully starts a brawl that spreads throughout the small port town. The slaves begin rowing out of the bay while Celaena and Sam make their way to the tower where the chain can be lowered. They get separated and Celaena fights Rolf, who is shocked when he sees Celaena without her hood and mask. He is surprised that she is so young and beautiful. In the end, Sam is able to lower the chain, and all 200 slaves escape. Celaena corners Rolf and forces him to sign a contract saying that he will never trade slaves again, and will go after anyone who does. Celaena is staying at the White Boar, a hotel in Innish, which is a port town. She is on her way to the Red Desert, where she is being forced to spend the summer training as punishment. Arobynn Hamel was very angry that she freed the slaves, so he beat her as Sam Cortland watched, and then told her she would go to the silent assassins in the desert, and if she did not get a letter of approval from the Mute Master, the leader of the silent assassins, there would be hell to pay. In the inn, there is a barmaid named Yrene Towers. When Yrene is taking out the trash, she is ambushed by several men. Celaena, who was itching for a fight, took them all down easily, but one escaped. She decides to teach Yrene some basic self-defense. This pays off, because only hours later, the escaped thief brings back more friends. Celaena pretends to be helpless when Yrene is held at knifepoint. Yrene uses the moves Celaena taught her to disarm the man, and Celaena reveals that she wanted Yrene to practice in a “controlled environment”. Yrene tends to Celaena’s wounds, and it is revealed that she wants to learn to be a healer at Torr Cesme, a prestigious school in Antics. However, Yrene has been working at the White Boar for a year because she can’t save enough to make it out of the city. That night, before Celaena boards her ship that will take her to the Red Desert, she leaves Yrene a bag full of gold and a ruby brooch, leaving a note that tells her to pursue her dreams. Yrene decides to leave for Tour Cesme with the money. Celaena arrives at the oasis in which the silent assassins train in the Red Desert. She’s roommates with Ansel, who she trains with. They become close friends as Celaena waits, impatient for her chance to train with the Mute Master. After a week, he begins to train her. Their sessions consist of her observing animals (asps, hares, bats, etch.) and mimicking their movements. Meanwhile, she goes on missions with Ansel in a nearby city to gather information on a lord who is trying to take down the silent assassins. The weeks go by, and Celaena and Ansel become closer, and Celaena strengthens as an assassin. On another mission in the nearby city with Ansel, Celaena comes across a trader selling spidersilk, which is an ultra-rare, indestructible material. Normally, a small patch costs a fortune, and the trader has yards of it. He offers some to Celaena in exchange for her killing the spider who gave him the silk. He says that he bargained twenty years of his life to get the yards of spidersilk, and the only way to get the years back on his life is to kill the spider. Celaena declines, but reveals that she is Adarlan’s Assassin, and says that she will maybe help him some other time. The merchant gives her a small square of spidersilk. In addition, she and Ansel steal Asterion mares, which are amazingly fast, expensive horses. A few weeks later, Celaena wakes up drugged in the middle of the desert with one of the horses. A note from Ansel says that she is no longer welcome with the other assassins, but that she received the letter of approval from the Mute Master. Despite her suspicions, Celaena makes her way to the port to return to Adarlan. Unable to assuage her doubt, she opens the letter–it’s blank. She rides back to the silent assassins as fast as she can, and finds that the keep was attacked, and many are left dead, including Ansel’s lover, Mikhail. The Mute Master and his son, Illias, are drugged and dying. Ansel had betrayed the keep in order to get troops from the lord who was trying to take them down. She needs the army to take back her home, which she was kicked out of at a young age after her family was murdered in front of her. Celaena is able to out-fight her and gives her twenty minutes to run. The Mute Master and his son are both okay. Celaena fires an arrow at Ansel as promised, but narrowly misses. However, she shot after twenty-one minutes, giving her friend an extra one minute to escape. Arobynn Hamel supposedly regrets beating Celaena and sending her to the Red Desert. He apologizes and showers her with gifts, including a fancy suit with knives embedded in the sleeves. Celaena gives the tailor the spidersilk from the Red Desert, telling him to put it in a place to guard the heart of the suit-but not her own. Instead, she gives it to Sam secretly, and it ends up saving his life from an arrow later on. Arobynn also gives her a job opportunity. An envoy is coming from Melisande to establish trade networks. The leader, Leighfer, is employing Celaena to kill her ex-husband, Doneval. Supposedly, he has a list of people opposed to slave trade and plans to blackmail them in order for them to change their vote. Meanwhile, Celaena realizes she doesn’t hate Sam. Things are tense at first because of Lysandra, a courtesan who latches onto Sam. Celaena denes it, but she is jealous. However, her jealousy is unfounded because Sam is very kind to her, and Celaena thinks that they may want something more from each other. Meanwhile, Celaena scouts Doneval, and kills him. She burns the list he has, but one of his associates says she is mistaken, and that Doneval “loves his country”. Arobynn Hamel then laughs at Celaena, mocking her for not figuring out he truth. Doneval’s documents actually showed safehouses for the slaves–he was against slave trade, and Leighfer was for it. This is the last straw for Celaena, and she pays off her debt to Arobynn with gold from the Mute Master (he gave it to her in repayment for saving his life). She buys an apartment and moves out. Sam confesses his feelings, and Celaena finds that she feels the same way about him. She sells her Asterion mare for a fortune and then pays of Sam’s debt to Arobynn as well. He moves into the apartment with her. Sam and Celaena are hurting for money after paying Arobynn to leave the Assassin’s guild. They decide to take on a HUGE job, one so dangerous that even Arobynn wouldn’t take it. The assignment is to kill Ioan Jayne, the Crime Lord, and Roarke Farran, his second in command. These two own the Vaults, which is a seedy place that serves as a brothel and a fight club. Sam often goes there to fight for money, despite Celaena’s wishes. Sam says he will kill Farran by himself, refusing to put Celaena in danger. She reluctantly agrees, and he sets of to take him down. Hours pass, and Sam still hasn’t shown up. She decides to go out and look for him, but Arobynn shows up and says that Sam is dead. She returns to the Assassin’s Keep to see his dead, mutilated body, which had obviously been tortured by Farran. Celaena passes out, and wakes up in her old room at the Keep. She overhears plans between Arobynn and Harding, one of the other assassins. They are plotting to kill Farran themselves, and they discuss the details of how they will do it. Celaena escapes the Keep and attacks with the details she overheard, too bent on vengeance to realize it is a trap. Wesley, an assassin she’s always hated, tries to warn her, but she knocks him out. She kills Jayne, the crime lord, and then poisonous gloriella gas is flooded into the room, and she is paralyzed. Farran had used the same drug on Sam; she recognized the smell from his body. When she wakes up, Farran hands Celaena over to the royal dungeons. The king himself decides her punishment, which is a life’s sentence at the salt mines of Endovier. There is a cutscene in which Arobynn and Farran are talking. They were actually working together to set a trap for Celaena and Sam. Arobynn got what he wanted because Sam ended up dead. He saw him as a threat that would take Celaena away. Farran got what he wanted because the crime lord was killed, leaving him to take the title.